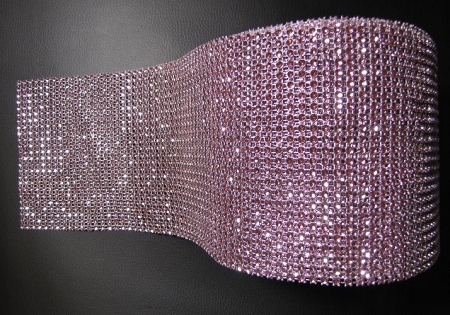 Rhinestone Baby Pink Bling is sold in 3 ft. (1 yard) long x 4 1/2" tall lengths. This Bling is very shiny and is sure to make any cake "pop." The Bling can easily be cut with scissors and has a silver backing. Non-edible or FDA approved. If using this product on an edible item, a barrier between the bling and edible item is recommended.